LANDOVER, MD. It was the first-ever meeting between two powerhouse franchises and this epic eastern conference showdown did not disappoint. It started with a bang - a touchdown on the opening kickoff - and ended with a whimper, as the DC Divas suffered their second loss of the season at the hands of the defending National Champion Chicago Force, who remain undefeated at 3-0. The Divas opening kickoff was misplayed by Force returner Dominique Jacobs who reversed field twice while yielding ground and fumbled inside the 5 yard line. A Diva player scooped up the ball and carried it into the end zone for a touchdown. The PAT kick was blocked by Angel Smith and picked up by Martha Dantuma who returned it 90 yards to the opposite end zone. League rules (same as NCAA) stipulate that a blocked PAT that is returned by the defensive team for a touchdown is awarded two points. So, just 10 seconds into the game both teams had scored, with DC on top 6-2. On the ensuing possession, Chicago marched downfield, scoring in just seven plays on a 16 yard pass over the middle to Jeanette Gray. Darcy Leslie successfully rushed for the two point conversion and Chicago led 9-6 just minutes into the game. It was a lead that Chicago never relinquished. DC pulled within a point at 21-20 midway through the second quarter, but the Force answered immediately with two scores and held a 35-20 lead at halftime. The Diva's starting quarterback Allison Hamlin was out with a foot injury suffered in week 1, so Chicago knew they would be facing a revamped offense. The DC backfield became much more explosive with Speedy Callie Brownson and Ashley Whisonant both taking snaps at QB, as they were able to consistently get running lanes on the edges. The Force defensive line didn't help their cause with four offside penalties, all of which extended drives and led to three scores. Chicago's offense was humming for the first three quarters, scoring touchdowns on 6 of their first 9 possessions. 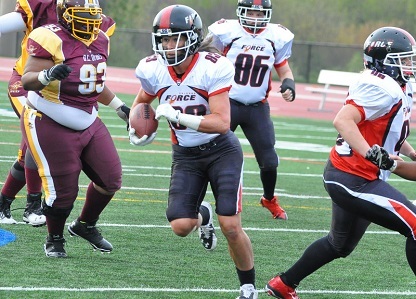 Force quarterback Sami Grisafe leads the league in passing yards and finished with 20 completions in 27 attempts for 308 yards and 3 TD passes. Wide receiver Jeanette Gray leads the league in all receiving categories and had another monster game with 15 receptions for 252 yards and 3 TD's, as well as a rushing TD and a two point conversion on a beautiful catch in the corner of the end zone. Running back Brandy Hatcher and wide receiver Jill Airaki each had a rushing touchdown as well. 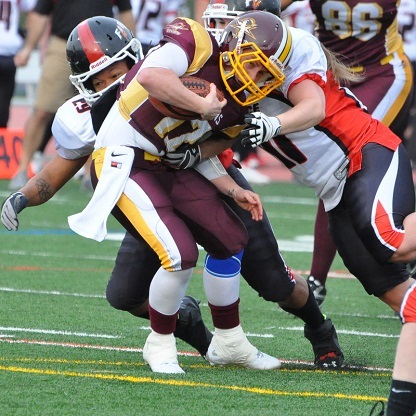 The Force defense was led by stalwarts Darcy Leslie with 16 tackles and Angel Smith with 11 tackles, 5 for a loss. Newcomer Emilie Belanger had 7 tackles. Jen Dulski had 4 tackles and, on the Diva's final offensive play, added an emphatic quarterback sack to punctuate Chicago's place atop the conference standings. Head Coach John Konecki has seen some things he likes from his team thus far. "It was a hard-fought battle between two upper tier teams. Through three games this season, some of our younger players have stepped up to the challenge." The next Force home game is Saturday April 26th against divisional opponent West Michigan Mayhem. Game time is 7pm at Evanston Township High School. For tickets and more information please visit chicagoforcefootball.com or call Sam Powell / Game Day Operations at 312-371-7813.